"I just wanted to ay a big thank you for sorting our order of door handles." "They are all on now and look fantastic, great quality". S Thompson. "Both Phil and Martyn were incredibly helpful and professional, and went out of their way to help me make my decision, supply the product in a timely and cost effective manner and answer and solve any queries or questions I had." "I feel I received top class service and as a result would definitely use Cheshire Hardware again, given the opportunity and highly recommend them, and the product I purchased." L McDonah. "Firstly I would like to thank you all for the service I received, which was excellent. The handles look wonderful and we are extremely pleased with the end result, both aesthetically and quality, which are superb. We wanted ironmongery that felt substantial to use, look good and would perform well and thankfully I was helped greatly on the appropriate choice for the latches etc." N West. "Thanks for all the technical advice. Martyn spoke to me in layman's terms and made me feel very confident with the purchase" P Harkness. 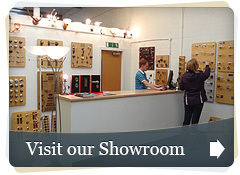 "It was a very good idea to visit your showroom despite it being two hours away! The advice I recieved was excellent and I am delighted with my door handles." D Blake. Our range includes door handles, door locks, door closers, hinges, window hardware, lighting, switches and sockets and security products from the best manufacturers in the UK, Europe and across the globe. If we don’t have what you are looking for on this site please contact us, we almost certainly sell it! Bespoke products are no problem. We are happy to export most of our ranges and regularly send products to Europe, USA, Australia and even Japan. You cannot order online for export orders, this must be done via e mail. Overseas sales are dealt with via a different process. Please feel free to call us! We recognise that Door Handles, Door Locks and Window Hardware are very confusing and complex subjects and we want to get your order right first time. No one wants to have to return items they have bought in error. If you are confused or simply prefer to shop the old fashioned way we welcome telephone enquiries and visitors to our extensive showroom. Our helpful and experienced and qualified staff are waiting to hear from you. We also deliver across the uk and worldwide on most ranges. We are very happy for you to test our pricing. If you have seen the same product elsewhere at a lower price, let us know and we will do our very best to beat it for you.